SAN LUIS OBISPO — A concept plan for a special wellness district in Ventura has earned Cal Poly city and regional planning graduate students accolades from the American Planning Association’s (APA) California Chapter. The City and Regional Planning (CRP) Department’s graduate studio received the State Academic Award of Excellence at the APA’s state conference Sept. 24 in Sacramento. The Wellness District Urban Design Concept Plan was also chosen in April for the Best Student Project Award from the APA’s Central Coast Section. The city of Ventura’s Planning Department hired Cal Poly’s spring 2016 graduate project planning studio to explore the potential for a special district anchored by the expansion of two important hospital campuses located in proximity to each other: the Community Memorial Hospital and the Ventura County Medical Center. The Wellness District concept plan recognizes the critical link between the built environment and public health and aims to change land uses, transportation options and physical design in order to reverse downward trends in people’s overall wellness and life span. The graduate studio’s work included a report, several posters, visual presentations and a presentation to the community depicting the plan development process and final proposal. Based on in-depth field studies and surveys, the project included a higher-density mixed-use core to act as a catalyst for neighborhood development; redesigned sidewalks and intersections; a new roundabout; more ground-level uses; and other improvements to enhance walkability and a sense of community — all consistent with Ventura’s General Plan and the city’s economic strategy. The studio instructors were Professor Vicente del Rio and Assistant Professor Amir Hajrasouliha. For more information visit the department website at https://planning.calpoly.edu. 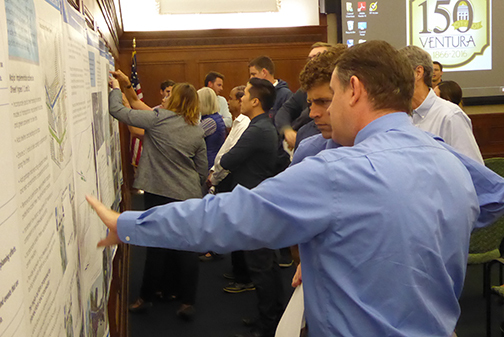 Cal Poly students, Ventura officials and community members during the public presentation of the Wellness District Urban Design Concept Plan in Ventura's City Hall. 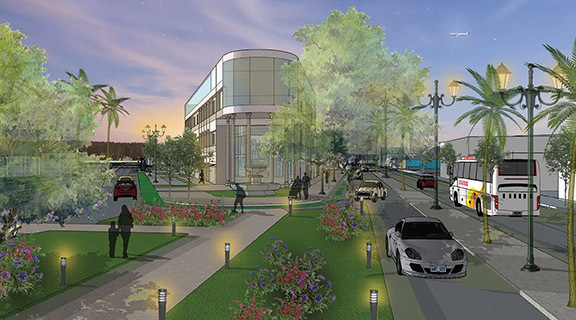 A rendering of one of the gateways into the Wellness District located at the corner of the redeveloped mixed-use core, featuring redesigned public spaces, new streetscaping, and traffic-calming solutions.